In a large saucepan, heat brown rice syrup just until boiling. 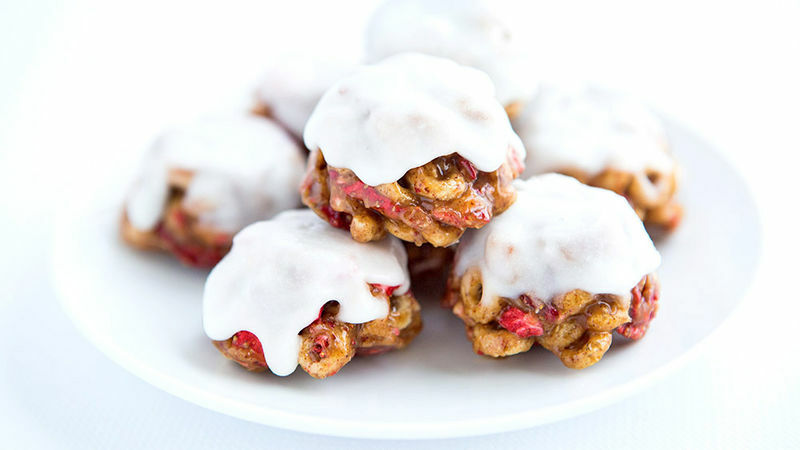 Remove from heat, stir in almond butter, Cheerios™ and strawberries. Press into a 12-count mini muffin tin which has been spraying with nonstick or lined with parchment liners. Place in the fridge and allow to set while preparing the topping. For the topping: whisk together yogurt, coconut oil and powdered sugar. Remove cereal cups from muffin tin, coat with yogurt icing. Return to fridge to allow icing to firm. For best results, store in the fridge. Enjoy within 1 week.